(Bloomberg) -- Selling “a rich man’s sauce at a poor man’s price” has made David Tran a very wealthy man. 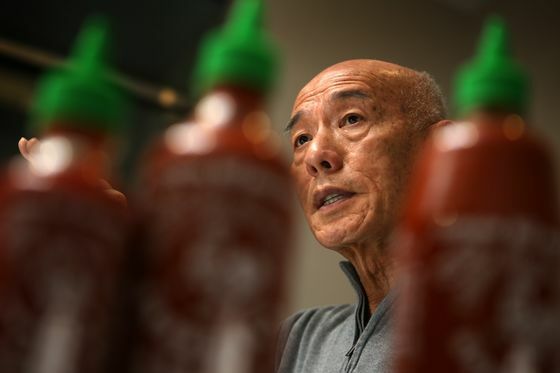 Now, almost four decades later, Huy Fong controls 9.9 percent of the $1.55 billion American hot-sauce market, according to IBISWorld, an industry researcher. 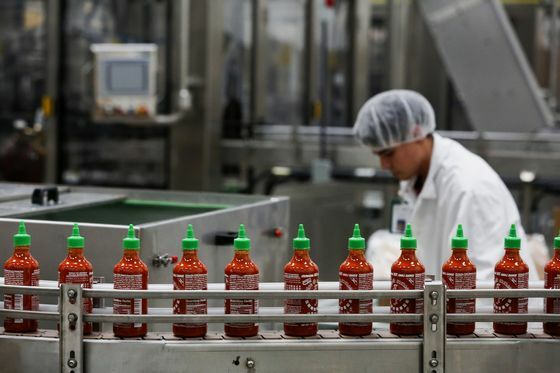 The Huy Fong factory in Irwindale, California, about 20 miles east of downtown Los Angeles, is a pristine facility with silver conveyor belts that each day shuttle hundreds of thousands of bright red bottles of Sriracha and their distinctive green caps into cardboard boxes. The factory, which operates up to 16 hours a day most days of the week, uses 100 million pounds of chilies each year. That’s enough spice to irritate the senses of some Irwindale neighbors. More than 8,000 miles away in a suburb of Bangkok, factory workers toil without air conditioning as forklifts roll through 90-degree heat hauling boxes of the same kind of chili sauce—this one with a red and yellow label and called Sriraja Panich. 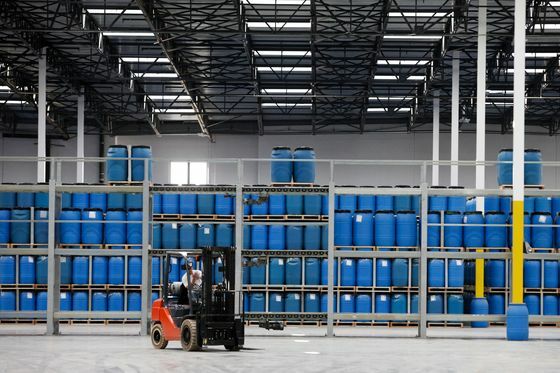 “If we can get just 1 percent of market share in the U.S., that would already be huge for us,” said Bancha Winyarat, the 33-year-old vice president of Thaitheparos PCL, which makes Sriraja Panich. The Winyarat family owns a majority of the publicly traded sauce maker, with a market value of more than 8 billion Thai baht ($251 million). Sriracha was first made about 80 years ago by Thanom Chakkapak, a woman from Si Racha, Thailand, a coastal town 73 miles south of Bangkok, according to the company’s website. 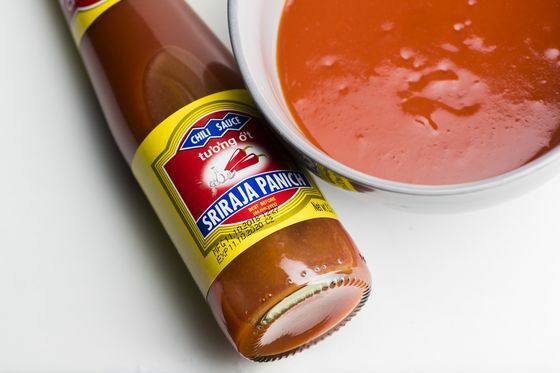 Bancha’s father purchased the Sriraja Panich recipe from Thanom in 1984—a year after Tran started making his own version of the sauce in L.A.
Soy sauce makes up the bulk of Thaitheparos’s revenue, with chili sauce accounting for just 5 percent, but it’s still the most popular local brand, Winyarat said. 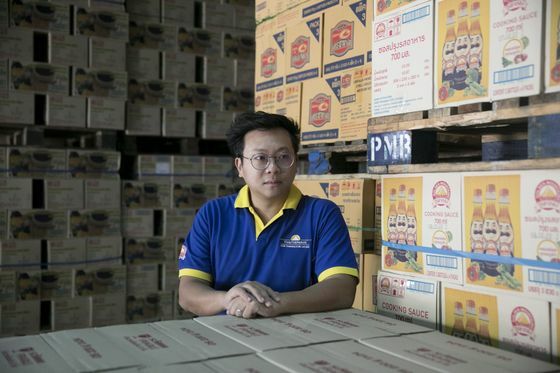 As Huy Fong’s Tran, the king of American Sriracha, expands in Asia and Thaitheparos targets the U.S. market, both are faced with different tastes and brand loyalties. Tran’s Sriracha uses fresh red jalapenos from across the U.S. while the less viscous Sriraja Panich uses cayenne peppers from northern and central Thailand. Tran said he has never tried Sriraja Panich. Tran’s Sriracha started out as a staple on the tables of L.A. Asian restaurants and grew into a national phenomenon. 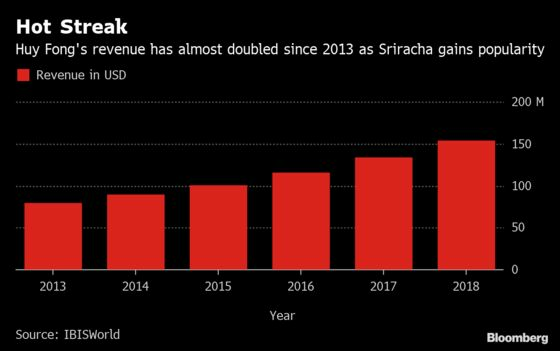 How Sriracha became so popular across the rest of the country is anyone’s guess, as Huy Fong has never advertised its products. The company’s relative obscurity is perhaps what helped it stand out and seem more authentic, said Anna Amir, an IBISWorld hot-sauce analyst. The fact that “people hear about it through word of mouth gives it kind of a unique edge in an industry with a lot of advertising,” she said. When he started the company, Tran struggled to find fresh chilies, so making enough sauce for existing customers was already difficult. Eventually he found one supplier: Camarillo, California-based Underwood Ranches. But after 28 years of it being the exclusive provider of Huy Fong’s chilies, Tran said, a dispute ended the relationship and Underwood went on to make its own Sriracha. “It’s very easy to make it if you have fresh chilies,” said Tran, who now has three U.S. suppliers.